This beautiful white handkerchief linen dress was made in Scotland in the early 1900s. Purchased at the Portobello Market in London, it features rows of tiny pintucks on the shoulders and lovely embroidery detail on the front yoke. A row of lace insertion to join the full gathered skirt is large enough for ½" ribbon to be inserted. The neckline and the long sleeves are finished with soft white lace with lace insertion that can accommodate narrow ribbon. 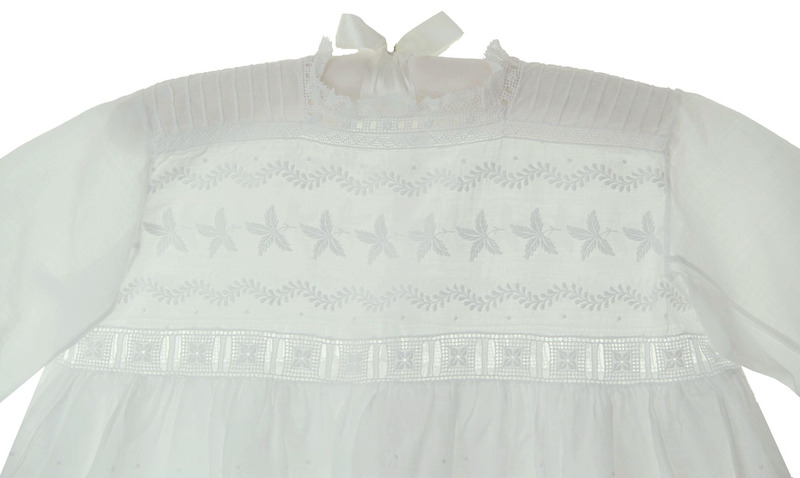 Pink, white, or blue ribbon (not included) would be lovely with this dress! The dress has an embroidered back yoke and closes with three shell buttons with hand made loops. The full skirt is fully embroidered with elaborate detail above the scalloped hem. 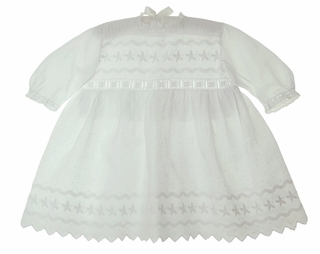 A gorgeous heirloom portrait dress, christening or baptism dress, or special occasion dress for your baby girl!